With contributions from: Guinn Batten, Eoin Bourke, Eva Bourke, Edward Boyne, Ken Bruen, Megan Buckley, Sandra Bunting, Patricia Byrne, Laura Ann Caffrey, Moya Cannon, Louis de Paor, Theo Dorgan, Noel Duffy, Susan Millar DuMars, Trish Finnan, Ndrek Gjini, Michael Gorman, Eamon Grennan, Gerard Hanberry, James Harpur, Aideen Henry, Kevin Higgins, Rita Ann Higgins, Dillon Johnston, Hugo Kelly, Thomas Kilroy, Susan Lanigan, Irina Ruppo Malone, Molly McCloskey, Mike McCormack, Conor Montague, John Montague, Pete Mullineaux, Val Nolan, Mary O’Malley, Christian O’Reilly, Ruth Quinlan, Thomas Dillon Redshaw, Moya Roddy, Ailbhe Slevin, Jordan Smith, Deirdre Sullivan, Áine Tierney, Eamonn Wall, Christian Wallace, David Wheatley, and Vincent Woods. It is now more than twelve years since Adrian Frazier arrived from the United States to teach in the English Department in NUI Galway at the height of a distinguished and varied career as a literary scholar whose fields of research and expertise lie in the area of nineteenth and twentieth century Irish prose, poetry, drama and cultural history. Glancing at his formidably long list of publications, which includes a comprehensive biography of George Moore (George Moore: 1852-1938), a detailed and very entertaining study of John Ford’s close collaboration with the Abbey’s crew of actors and directors in Hollywood (Hollywood Irish: John Ford and Abbey Actors in the Movies), several book publications edited or co-edited by Adrian on various aspects relating to Irish poets and dramatists, as well as countless papers, articles and reviews on a wide range of topics to do with the work of Irish poets, playwrights and film-makers, it quickly becomes clear that Adrian is not only knowledgeable about his subjects but that his approach is also invariably original and thought-provoking. Keeping in mind that he had been actively involved in drama productions and had published poetry in the past, it is not surprising that his attitude to education should be holistic and diverse, providing for instruction that is not only theoretical but also hands-on, practice-based and creative, and that as a consequence he set up a taught MA in Drama and Theatre Studies in 2000, followed by an MA in Writing two years later. Convinced of the educational value of postgraduate programs in which students explore their place in the outer world as well as their emotional responses and their sensations creatively, he structured the MA programs in such a way that aspiring writers are given the opportunity to discover their individual talents and passions and to work with a great sense of fulfilment. Both MA programs are practice-oriented, the plays written throughout the year are produced, directed and acted by the students themselves, and the MA in Writing offers, uniquely among similar programs in the country, the chance of trying out a variety of genres, from poetry, to fiction, to screen-writing, to non-fiction, in order to allow the students to find out where their own particular interests and strengths lie. These MA programs constitute a resource of universally-educated spirits capable of imaginative solutions, people who might have continued, or will continue on to other careers, academic or otherwise, who have grown in confidence, empathy and flexibility of mind, and are able to draw on their experiences of creative practice as well as on academic perspectives. This Festschrift, Watching My Hands at Work, consists of poems, short stories, essays and extracts from novels and plays written by graduates of the MA in Drama and Theatre Studies and the MA in Writing, by tutors teaching in the programs over the years and by practitioners of the art from inside and outside Ireland who came to speak of their own personal experiences of writing and publishing to the participants. 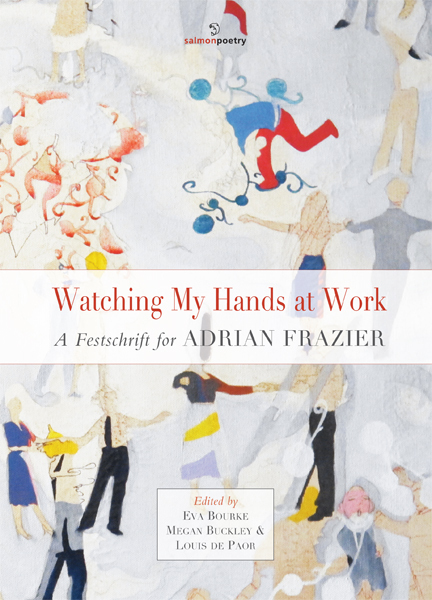 It has been put together to honour and celebrate the invaluable contribution Adrian Frazier has made to education and the arts in NUI Galway and further afield in the literary community of Galway and Ireland as a whole. When thinking of him the words that come to mind immediately are integrity, tolerance, generosity and passion. The enthusiastic response to our call for submissions attests to the gratitude and love felt by so many towards Adrian—particularly current and former students. Moreover, this Festschrift is intended to highlight and celebrate the 10th and 12th anniversaries of the M.A. in Writing and M.A. in Drama programmes, respectively. Long may they continue and thrive.